Squirrels inhabit just about every backyard across Long Island. 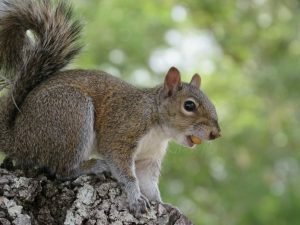 The most common squirrel on Long Island is the gray squirrel, although fox squirrels, red squirrels, and flying squirrels can also be found on the island. Unfortunately, like many outdoor creatures, squirrels are incredibly destructive when they get into your house. For the most efficient squirrel extermination, call the experts at Twin Forks Pest Control. A member of the rodent family, squirrels have fast growing teeth and in order to prevent them from growing too long, they will chew on just about anything, including wood, metal, and hard plastic. This means that they can cause irreparable damage to just about anything in your home including flooring, walls, wiring, insulation, and much more. Squirrels are quite acrobatic and can climb upside down in order to gain access to openings in attics and soffits. If you’ve ever watched squirrels leaping from tree limb to tree limb, you know exactly how agile they can be. Once inside your home, they will build nests to raise their young and return to them year after year, unless the entry holes are securely sealed. Squirrels carry a number of diseases that pose a danger to humans and domesticated pets. They can carry leptospirosis, which causes irreversible kidney and liver damage. They can transmit Lyme disease, a disease that can result in permanent joint, heart, and nervous system problems. Squirrels have also been known to carry rabies, a disease that is fatal to domesticated pets not vaccinated against it. Protect your family and your home or business by getting rid of squirrels before they cause expensive damages. Our wildlife removal experts can humanely trap and remove whatever animals are invading your home. Our work is guaranteed so you don’t have to worry about them coming back. Whether you live in Baiting Hollow or Bridgehampton, give the experts at Twin Forks Pest Control a call today at 631-287-9020 to schedule your free estimate.